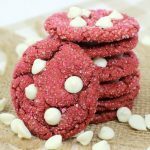 Cake Mix Red Velvet Cookies – These beautiful looking cookies are so easy to make and taste out of this world delicious. I love using cake mixes for cookies, they always come out just right. Enjoy the crunchy outside and chewy inside. A perfect combo. YUM! 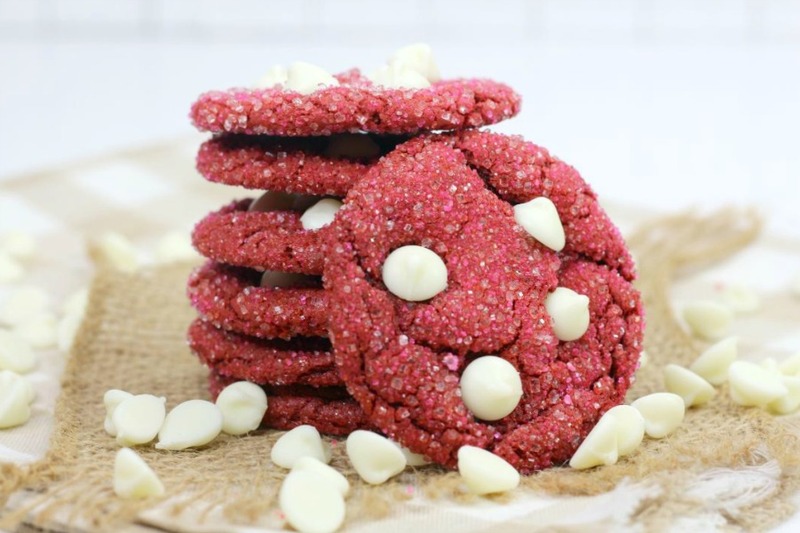 Getting back to these red velvet cookies, you only need a few other ingredients along with the cake mix and by adding in the white chocolate chips, it’s almost like that’s the frosting. The crunchy outside of the cookie comes from sanding sugar that you can find at most markets in the baking section or in any craft store. 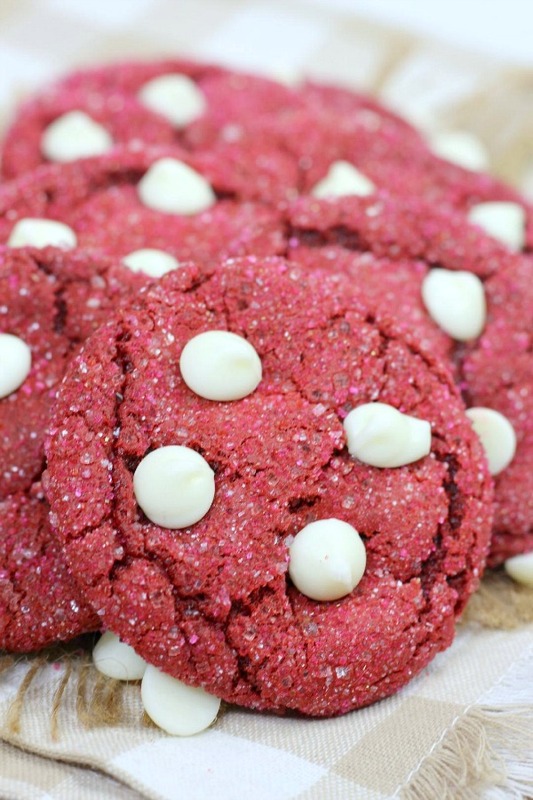 Bake a batch of these for Valentine’s Day. They are sure to put a smile on someones face. Preheat oven to 350 degrees, line two large cookie sheets with parchment paper, set aside. Using a stand or hand mixer, combine cake mix, oil, eggs and vanilla extract. Mix until combined well. Take a spatula and dig down to make sure all the dry is incorporated into the wet. Place dough in fridge for about 30 minutes. Roll about 2 tablespoons of dough in hands and place on one prepared cookie sheets. 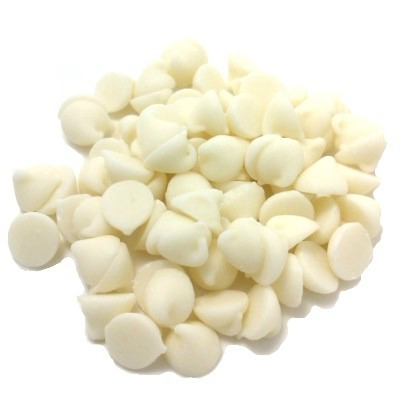 Place sprinkles into a bowl and roll each ball into the sprinkles. Place back on cookie sheets. Bake for about 7 to 8 minutes. Take out of oven and place a few white chips on the top of each cookie. Put back in oven for just 2 minutes. Take out and let cool on pan on a wire rack then transfer cookies onto the wire rack to cool completely. That was fun, right!? 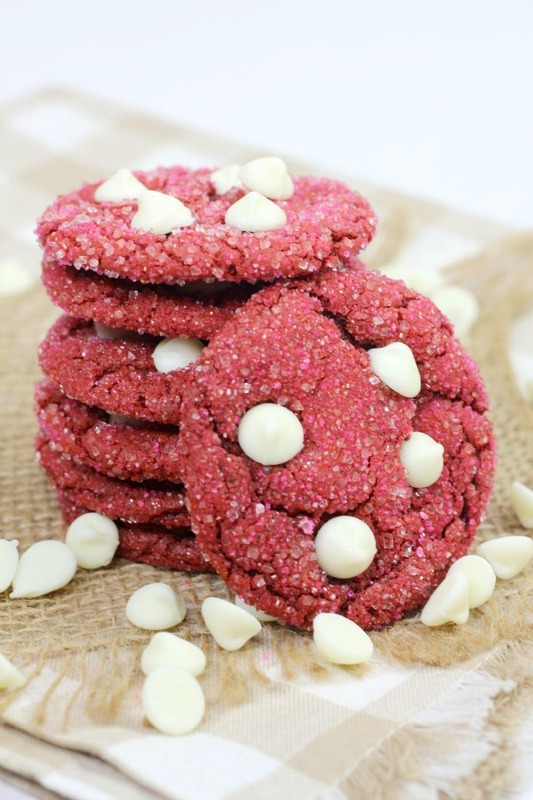 Enjoy the red velvet deliciousness! 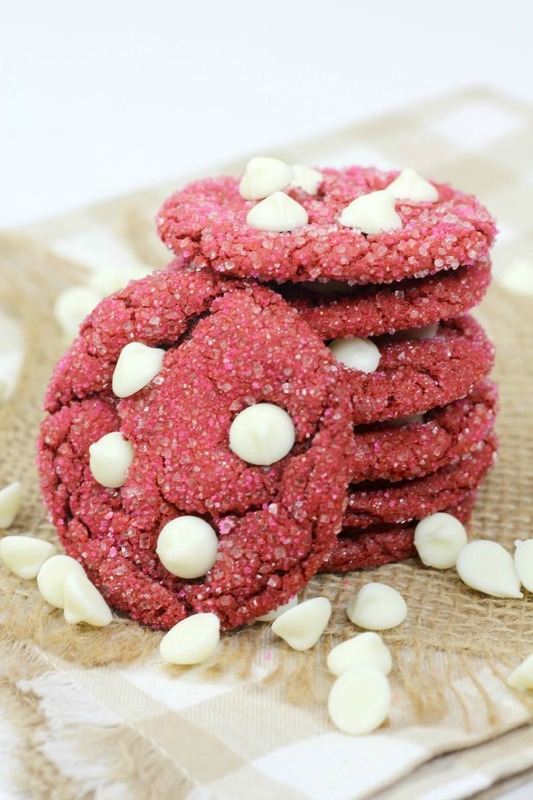 These beautiful looking cookies are so easy to make and taste out of this world delicious. I love using cake mixes for cookies, they always come out just right. Enjoy the crunchy outside and chewy inside. A perfect combo. YUM! 1.Preheat oven to 350 degrees, line two large cookie sheets with parchment paper, set aside. 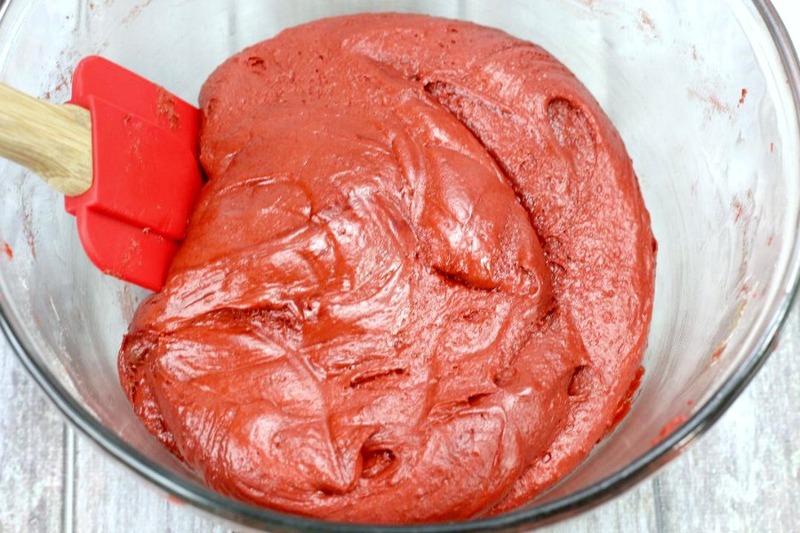 2.Using a stand or hand mixer, combine cake mix, oil, eggs and vanilla extract. Mix until combined well. Take a spatula and dig down to make sure all the dry is incorporated into the wet. 3.Place dough in fridge for about 30 minutes. 4.Roll about 2 tablespoons of dough in hands and place on one prepared cookie sheets. 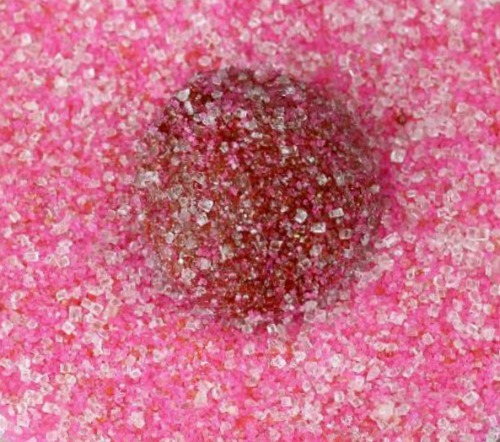 5.Place sprinkles into a bowl and roll each ball into the sprinkles. Place back on cookie sheets. 6.Bake for about 7 to 8 minutes. Take out of oven and place a few white chips on the top of each cookie. 7.Put back in oven for just 2 minutes. Take out and let cool on pan on a wire rack then transfer cookies onto the wire rack to cool completely. That was fun, right!? Enjoy!